Leaving Scorpions, UFO, and the 1970's behind, German guitarist Michael Schenker welcomes the 1980's by embarking on a solo career with a self-named band. He assembles a group and records two relatively similar albums in two years: The Michael Schenker Group in 1980 and MSG in 1981. The 1996 CD release combined both albums on one disc. The two albums are quite similar in style and content. Shortish, rather simplistic tracks straddling the line between harder rock and accessible metal, aiming for a radio friendly, commercially appealing sound but with a bit of an edge. Schenker's guitar is showy and energetic without ever being in the same groundbreaking class as the greats of the day, like Blackmore, Van Halen, Iommi, and the Maiden twins. Gary Barden on vocals has a good range and injects only slightly annoying emotion, but he always sounds strained. The drums, bass and keyboard duties were cleaned out after the first album, despite the presence of talent like Simon Phillips and Don Airy, to be replaced by more famous names like Cozy Powell and Paul Raymond. It really does not make much difference: the drums, bass and keyboards never emerge from the deep background on either album. Armed And Ready and the instrumental Into The Arena are the two best tracks of the lot. There are several other solid songs to be found, including Cry For The Nation, Lost Horizons, On And On, Let Sleeping Dogs Lie, and But I Want More. None are earth shattering, but they do create a respectable legacy. Michael Schenker may not have been a metal trailblazer, but with his flying V, he was a welcome contributor. 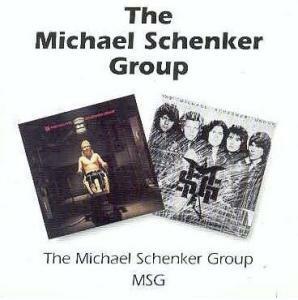 The Michael Schenker Group: Produced by Roger Glover. Engineered by Gareth Edwards. MSG: Produced and Recorded by Ron Nevison.